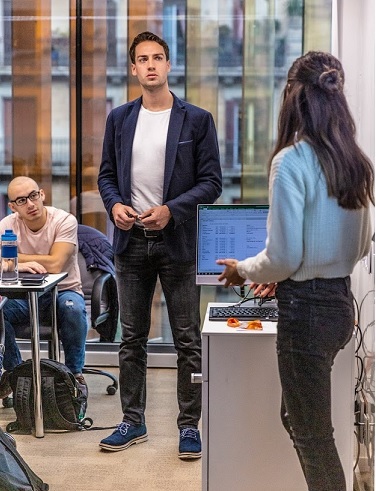 We interviewed EADA alumnus Philipp Herz, professor of the Master in Management Personal Inspiration Week course Leadership Skills to Launch a Successful Career After Business School. Philipp is a Commercial Managing Director in Germany, currently building the future of his family business. In Philipp’s previous life, he was a professional football player. However, he decided to pivot his career with a BSc in Business Administration and an International Master in Management from EADA, where he graduated at the top of his class. He went on to receive a scholarship to complete his MBA at the University of San Diego in California. Since 2016, he has been an adjunct professor at EADA, drawing from his experience in consulting at Bearing Point, Deloitte Luxembourg and CMS Germany. Today´s next-generation-managers are inspired by the idea that there are no limits. If you want to achieve something, you can do it. What is the biggest take away for you as an alumnus coming back to EADA? The advancement of technology and the breakdown of national barriers have given birth to a connected-economy where professionals compete in a global marketplace. As a professor, I aim to help students build their unique competitive advantage to compete in this marketplace. For me, it is very important to tell students that failures are not a problem at all. The most important thing is that you can learn from your failures and that you get up again. One of the biggest take aways from coming back to teach at EADA is that I am in an incredible position to shape the next generation of leaders and managers. My role as a professor is to help students prepare to enter the corporate world and to balance their personal and professional life effectively. How important is being able to pivot careers? With companies that are constantly disrupting the market, skill requirements have been raised, and the ability to be able to pivot careers will become increasingly important. Graduates will need to know how to continually raise their value and successfully build and keep their competitive advantage. If you do what you are passionate about, you will be happy in all aspects of your life, and if you are happy with what you are doing every day, success will find you. I always tell my students that most people stop learning after graduation, but this is when life starts. It is like starting back in the kindergarten again, and you need to learn every day in order to build and keep your competitive advantage. The person you will be in 5 years is determined by the people that you meet and the books that you read now. How would you define personal and professional success? In your opinion, what is the most important factor in obtaining success? If you do what you are passionate about, you will be happy in all aspects of your life, and if you are happy with what you are doing every day, success will find you. The most important factor in obtaining success is that you commit to your passions in both your personal and professional life.